This Leatherman is my constant companion, I EDC it everyday. GOOD- price, small enough to fit on my key chain, several tools that get small and medium EDC tasks done. BAD- the small tools can be hard to get out with my large size hands. I bought one of these to take to South America with me on travel. I wanted something small that I could keep in my pocket. Additionally I wanted something that wouldn't alarm somebody is countries where knife use is not as common(or even illegal). Since I'm not familiar with the knife laws in many of the places I visited, I wanted something with a very short blade, and I wanted something with no locking feature. 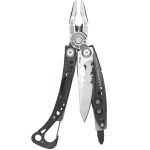 The Leatherman Squirt(I chose the PS4 because I like the pliers) has been just the ticket. It has been very durable, easily concealable and any time I pull it out nobody bats an eye. The tools it has are a knife blade, a nail file(that doubles as one size of flathead screwdriver), a bottle opener(which doubles as a smaller flathead screwdriver), a pair of scissors, an even smaller flathead screwdriver(that doubles as a wedge), a small set of pliers, and wire cutters. By far the unspoken hero are the wire cutters. They are easy to miss when first looking over the tool, but I use them all the time. Most frequently I use them to cut the ends off guitar strings after I restring my guitar. Another thing that is difficult to notice when viewing pictures of the multitool is the texture on the grip. In the pictures it looks very smooth, but it is actually a little bit porous, which aids stability when I am using my squirt with sweaty hands(this happens frequently in South America near the equator). If I had one complaint about the squirt ps4, it is that the keyring on the tool isn't particularly robust looking. I don't attach mine to my keys, so I have not been able to test this hypothesis, but compared to the rest of the multitool this feature looks a little underbuilt. I suppose that it doesn't have to withstand a great amount of loading, but it wouldn't have killed Leatherman to use slightly thicker steel on the loop, that's all. 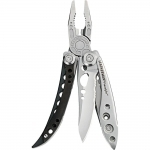 Overall I recommend this multitool to anybody who needs to small multitool that prefers the look of a Leatherman over a swiss army knife, or to anyone who would find a small set of pliers useful when carried on their person at all times. I think Leatherman did a nice job with this one. I have three Squirts, P4, E4 and PS4. These are the miniature toolbox from Leatherman. P4 and P4S are identical, but the PS has also scissors. This is my keychain tool I use a lot at work (I'm a nurse). In my work you find a lot of stuff to repair (tighten the screws, fixing some medical equipment etc.) and Squirt family follows me everywhere I go. It has all the tools you need to be able to fix things as the come. Ofcourse you can't do heavy duty stuff with these minitools because they would probably break. And because of it size, patients don't run screaming when you take this one out =D. 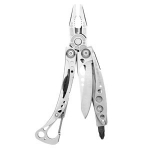 Leatherman Squirt P4 and PS4 has saved the day so many times I have lost the track. Even some of my colleagues have bought one of the Squirts. 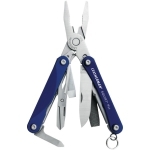 I have loved Leatherman since I was a boyscout, and have owned several since then. This knife drew my attention because of the size, at first I wasn't sure I was going to like having such a small multi-tool, but I quickly grew to love it! It is great for dressier occasions, because it is so small, however it really does pack a punch. I like also that it fits into the fifth pocket of your jeans, leaving plenty of room for a EDC single blade knife. I couldn't be happier with it's performance, and again Leatherman's overall quality and craftmanship.